What do you wear to a birthday brunch on a snowy and cold day? 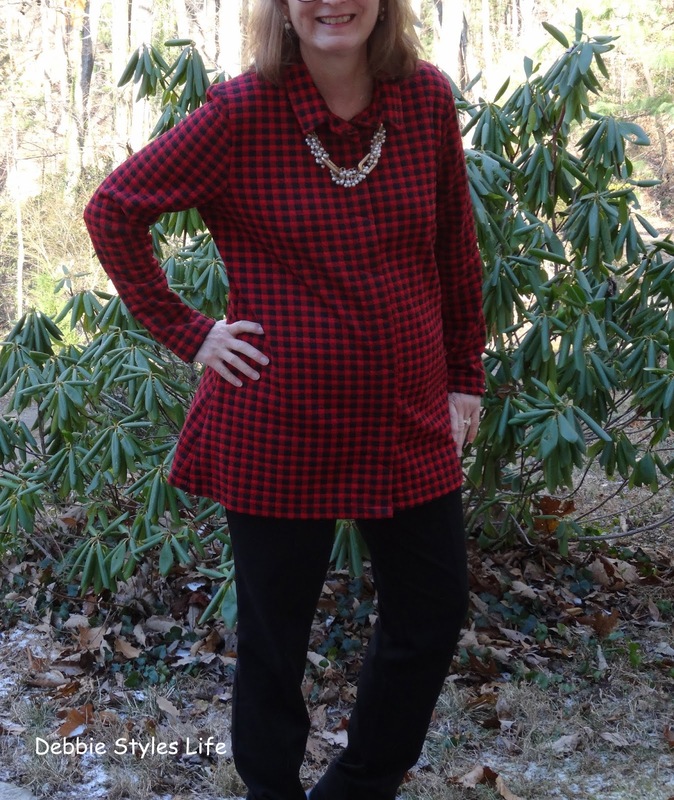 How about a buffalo plaid jacket worn as a blouse, long pants and snugly ankle boots? This was my outfit of the day as I made my way to a special birthday brunch hosted by my friend, Sharon, with these lovely ladies attending. 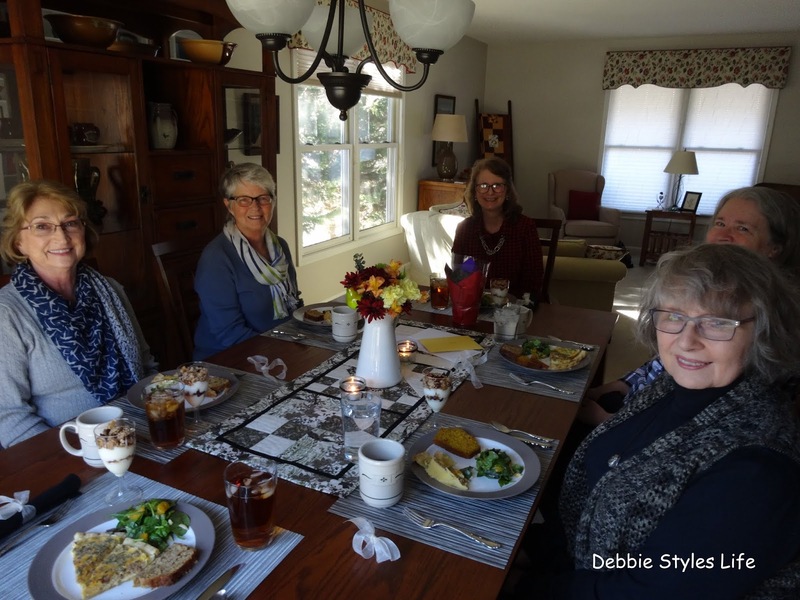 How wonderful it was to spend time with these women eating delicious foods, laughing and talking. We all worked together for many years and they definitely made me feel much more positive about turning 60 in a few days! Yes, I'm changing decades! 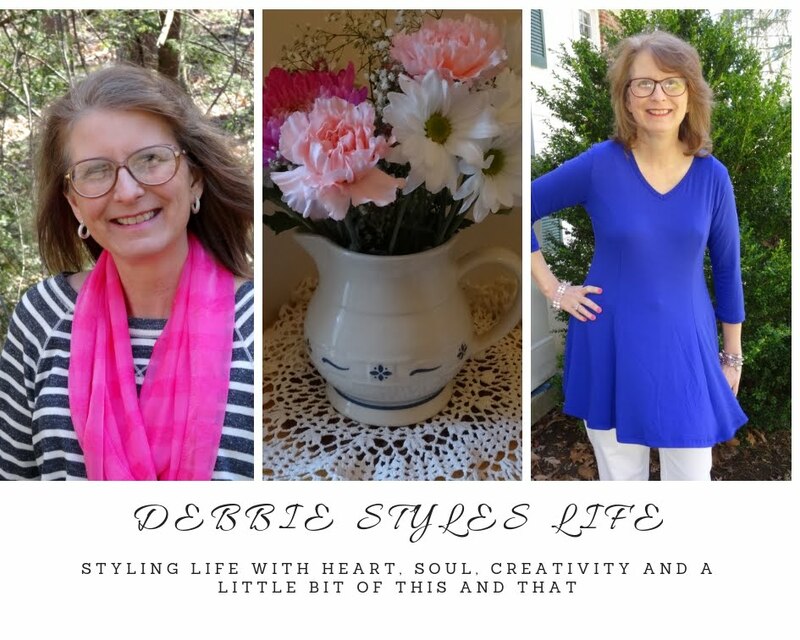 More to come on my thoughts about turning 60 in an upcoming post! Sharon was kind enough to snap a photo that included me. You can see the yummy quiche, salad and nut breads that we enjoyed. 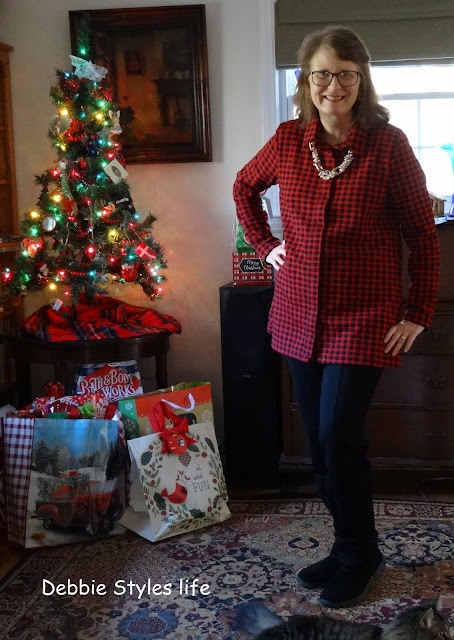 Getting back to the buffalo plaid...this top is billed as a "jacket" but to me it is a very soft and cozy blouse and that is how I intend to wear it. It is quality made by Peck and Peck and I found it, where else, at Stein Mart! This top is a bit pricier, to me, but you can feel the quality when you put it on and I did have a coupon for 20% off. The fabric feels slightly quilted but is not over warm, just luscious and cozy. I actually added a long sleeve scoop neck pullover underneath for extra warmth. It was blowing snow here today and the high was only in the 30's so a little extra warmth was needed! Another nice feature to this jacket/blouse is that the buttons are hidden giving a smooth look. And, yes, Cassie photo bombed this shot! She is still a bit sore that Garden was in the last post and she wasn't! The pants, by Rafaella Comfort, fit almost like leggings although not as tight as leggings would be. 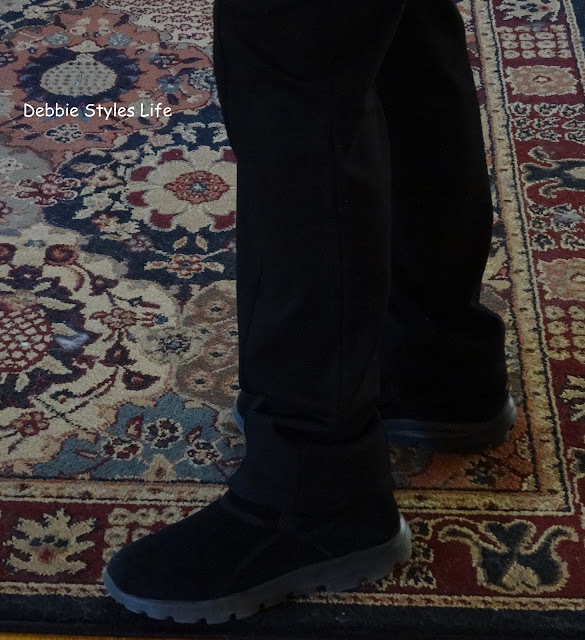 They taper in the leg and work well with an ankle boot like I have on here. They also have a faux leather band on the closed pocket which gives a touch of elegance. The material is a soft ponte knit which feels substantial in the cold. I know I will be wearing both of these pieces frequently. 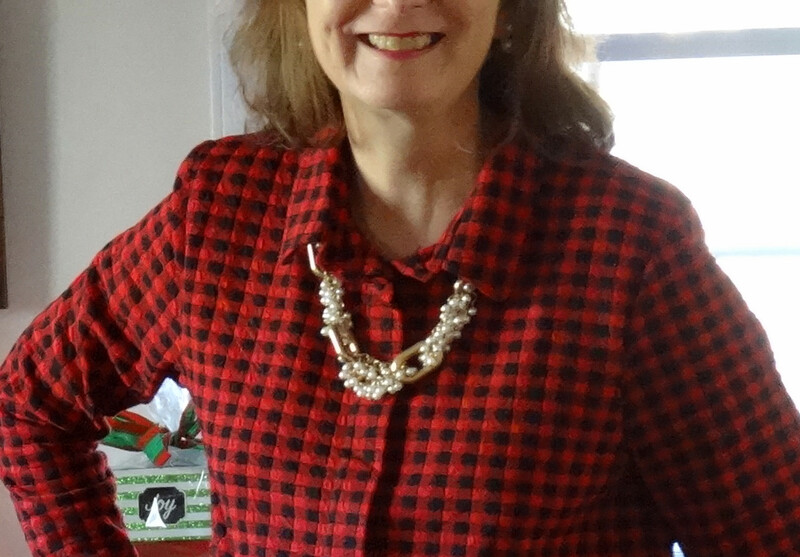 Although a longer necklace would work well with this top, I chose, instead, a chunkier look gold link necklace with pearls. It fit under the collar nicely and gave just a bit of bling to the look. How is your week going? 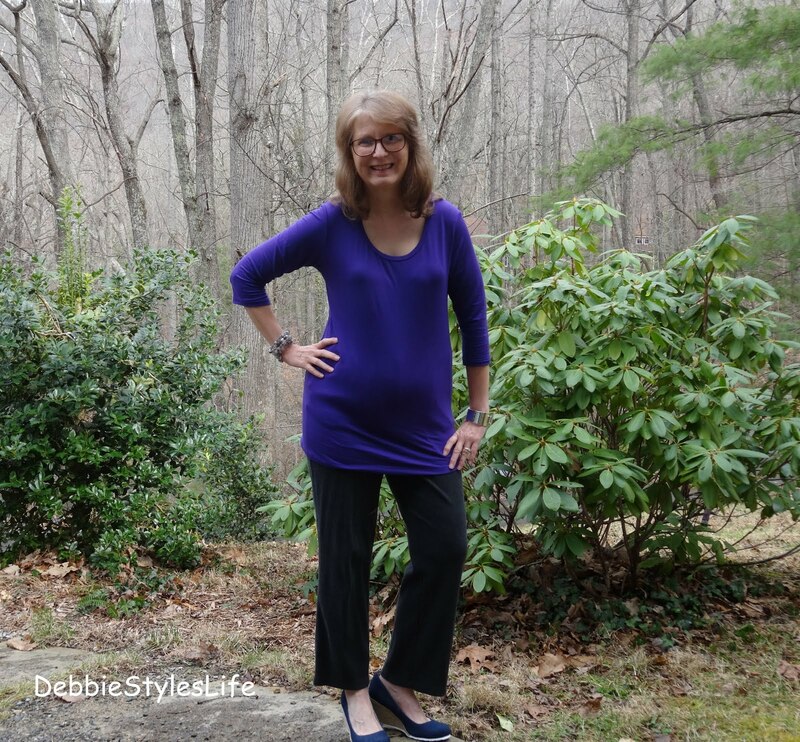 Are you looking for warm and cozy clothing to wear? Is there snow where you live? How do you like the buffalo plaid look that is so popular right now? Do take a moment and leave a comment. I love hearing from you! Debbie, I would never have guessed that your trending buffalo print top was intended as a jacket! It looked beautiful on you at the brunch, and I think it works perfectly as a warm and cozy top. By the way, I'm looking forward to hearing your thoughts on turning 60. I so enjoyed getting together with this group of talented and interesting women. Thanks for having a birthday to spur this occassion. I hope your 60th decade is sensational! 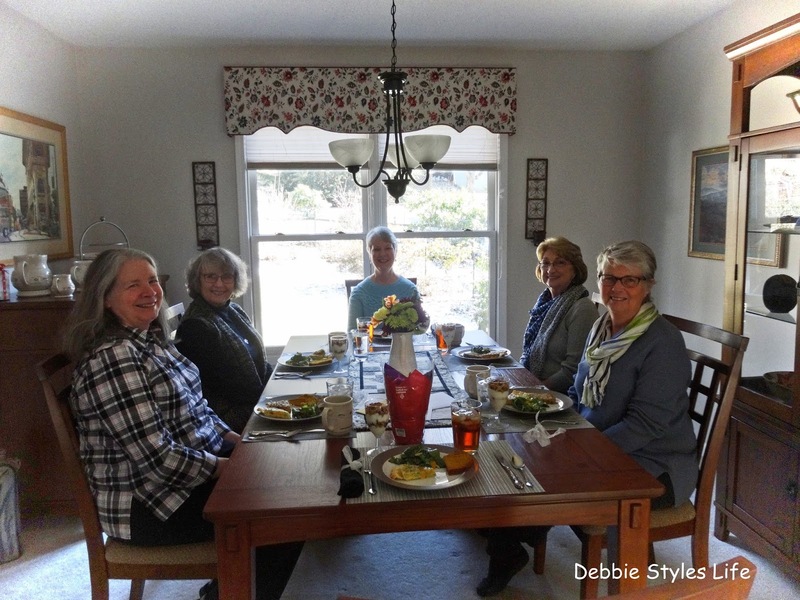 Hi Debbie, how nice to see you with your friends - and not forgetting Cassie! - at the birthday brunch. It's really nice to see fellow bloggers in their life context, as it were. So I'm so fond of quiche, so I liked your menu btw. I think your outfit is great; it's the sort of relaxed style that I like and wear. I think I mentioned in a reply to an earlier post of yours, that I often feel a bit chunkier in the winter, so appreciate something a little longer to cover up! The material looks nice and solid, which I always find to be flattering. The necklace I love with it. It's a really versatile outfit by the looks of things - you could easily add a warm woolly scarf and it would work well too. No snow here in the Midlands of the UK, just dark, windy and rainy days. 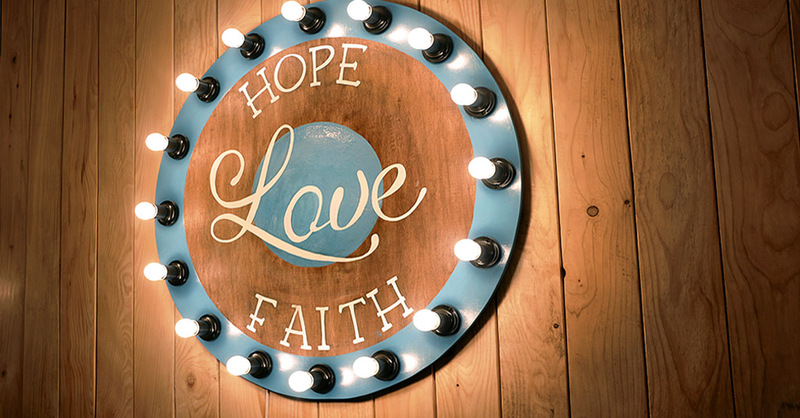 The lights of Christmas will add some cheer, hopefully. Do not worry about turning 60, Debbie. You are still young. In 2017, I turned 70 and that year my father decided to sell the family farm. Clearing out 11 buildings and getting ready for 3 open houses and a public sale was a huge job. We moved into a smaller space. Living on the farm was wonderful, but he and I could no longer do all that was required to maintain the property. Lots of grass to mow in the summer. Lots of leaves to gather in the fall. And lots of snow to move in the winter. Spring was always a delight. 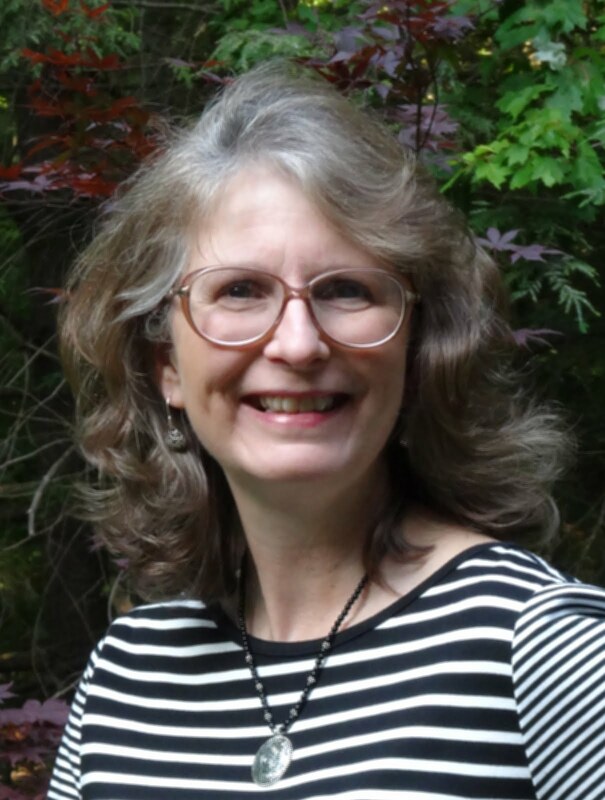 In September 2018, I moved on to 71 and two days later my father was admitted to the hospital with pneumonia. Then rehab. Then home. I was totally sleep deprived. Exhausted. Last October and this October came with lots of challenges. I wish I was 60 again. Debbie, just enjoy life one day at a time. Thankfully, God provides the energy needed (which I came to refer to as Manna during the season of our sale prep) one day at a time.